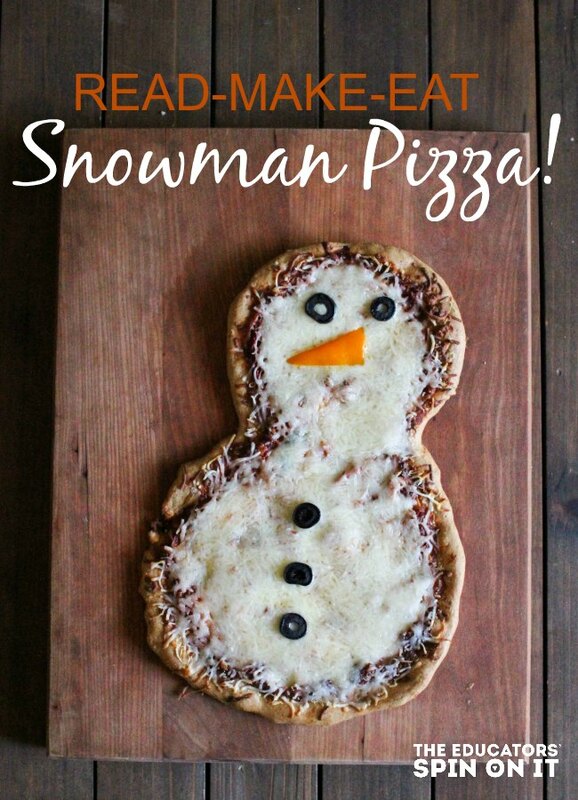 Move over Frosty the Snowman, we’re about to warm up the house with this Snowman Pizza Recipe! Snuggle with your child and read a few snowman books, then head to the kitchen and get inspired by books to make your pizza. Kids can do everything from measuring to decorating! Brrr… It’s cold outside. If your kids are like mine, they LOVE snuggling in with a good book. A recent favorite is Sneezy the Snowman. He’s sooo cold and can’t seem to get warm enough. Sneezy tries everything from drinking hot chocolate to warming up by the fire – AND MELTS every time. Luckily this kids build him up each time and eventually figure out a way to keep his temperature – just right. Olives. One to-go cup is the perfect amount. You can add more if you like olives (none of my kids do, so we just add it for decoration. Orange Pepper – cut into a triangle shape for the nose. Next, separate the dough in half. Roll each half into a ball. Press the dough on the baking sheet in a snowman shape. 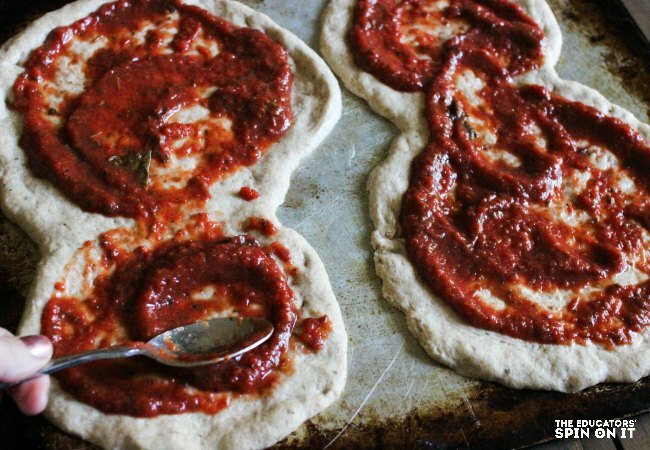 Repeat for the other half of the dough. To fit two snowman on one sheet, have their heads facing in opposite directions. Spread the sauce on the snowman to your desired constancy. Then sprinkle with cheese. 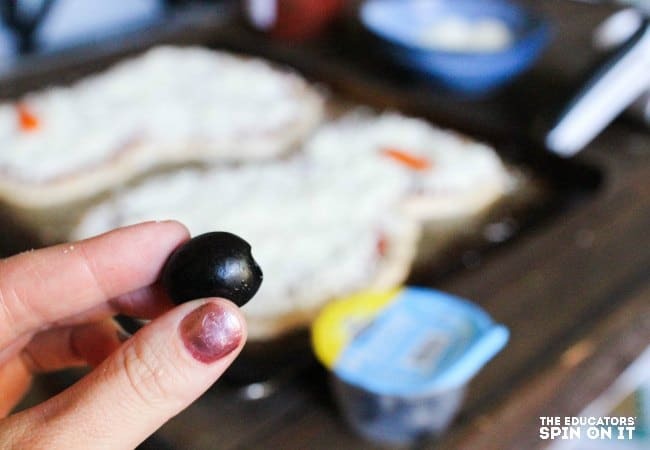 Slice the olives into thirds. 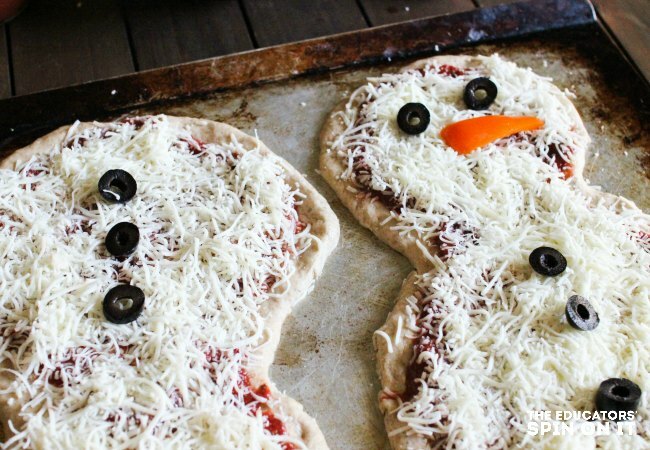 Use the olive slices as the eyes and buttons on the snowman pizza. Bake as directed on your dough recipe or package. Ours baked for 15 minutes at 425 degrees. 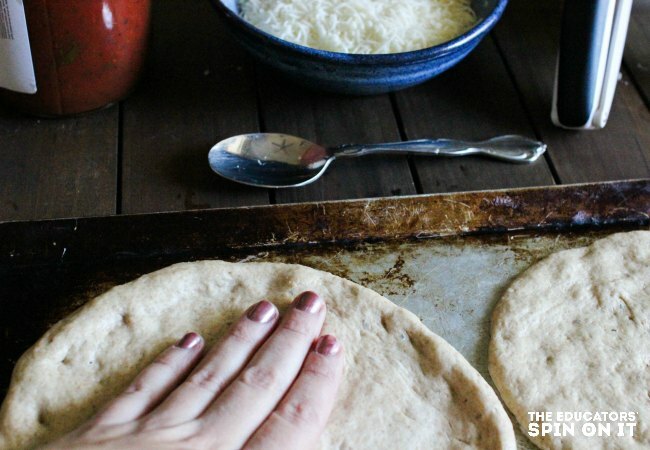 Remove from the oven with baking mitts.